In the spring and early summer of 1861, the position of neutrality taken by Kentucky was respected to such an extent that camps of enlistment of Union troops from Kentucky were established outside the state; one opposite Louisville, known as Camp Jo Holt, and one opposite Newport, called Camp Clay. The 1st Ky. Infantry was recruited and organized at Camp Clay by Col. James V. Guthrie, and was mustered into service of the United States, June 4, 1861, by Maj. S. Burbank. The 2nd Ky. Infantry was associated with this regiment at Camp Clay, and during its entire history. As soon as these two regiments were organized, they were ordered to proceed by steamboat, up the Ohio River, to unite with other forces against the Confederates in what is now West Virginia. July 2, 1861, Gen. McClellan, who then had command in West Virginia, ordered Gen. J. D. Cox, to take the 1st and the 2nd Ky. Infantry into his command, and to proceed up the Kanawha River. July 25th, Gen. Rosecrans, who was then commanding in West Virginia, at Grafton, was organizing his forces into the 4th Brigade, to consist of the 1st and 2nd Ky. Infantry, with the 12th, 19th and portions of the 18th and 21st Ohio, to be called the Brigade of the Kanawha, under the command of Gen. J. D. Cox. In the month of July, 1861, the two regiments had numerous engagements in West Virginia, fighting at Gauley Bridge, Beverly, Red House, and other places. On the 18th of July, Col. Woodruff, of the 2nd, was captured. The two regiments remained in West Virginia during the fall, and part of the winter. They were both full, numbering each about a thousand men. In December, 1861, they were at Charleston; in this month, Col. Guthrie resigned and David A. Enyart was commisioned colonel, and continued to command the regiment during its entire career afterward. Early in Jan., 1862, they were ordered to join the Army of the Cumberland. They proceeded to Louisville by boat, and from thence marched to Bardstown, where they were in January. In February they were at Green River, on their way south with Buell’s army. Upon the fall of Fort Donelson, in February, they moved to Nashville. The 1st was in Bruce’s brigade, Nelson’s division. It accompanied Buell’s army to Pittsburg Landing, Tenn. The brigade contained the 1st Ky., Col. Enyart; 2nd Ky., Col. Sedgewick, and the 20th Ky., Col. S. D. Bruce. Gen Nelson says in his report of the battle of Shiloh, that he had his entire division across the Tennessee River by 9 o’clock p.m., Sunday. April 6th, the first day of the battle, Bruce’s brigade was to the right of Ammen’s brigade, and to the right of Bruce was Nelson’s center. The work of Nelson’s division at Shiloh is historic. In it were four Kentucky regiments, 1st, 2nd, 6th, and the 20th. Col. Enyart, of the 1st, in his report of Shiloh, says his regiment lay on their arms all night, and at 4 o’clock next morning advanced and fought through that day driving the enemy steadily, but receiving tremendous fire in so doing. He commends the coolness and courage of Lieut. Col. Leiper, Maj. Cahill, Adjt. Wright, Capts. Barr, Becker and Hadlock, and Lieut. Smith. Col. Bruce, commanding the brigade, says, the 1st Ky. deserved the highest commendation, that it "was in full range of the enemy’s fire, and at all times maintained its formation, with a tenacity becoming veterans." From Shiloh, the regiment marched to Corinth, and in the operations at that place, Gen. Manson, in his report, compliments its service. From Corinth, the 1st followed Buell’s army in all its movements in Tennessee and Northern Alabama, and in the celebrated march to Kentucky, participating in all the long and severe marches, and took part in the pursuit of Bragg from Kentucky. It then returned to Tennessee, and was with the army when under Rosecrans. In the organization immediately preceeding the battle of Murfreesboro, the 1st was still commanded by Col. Enyart, in Cruft’s brigade, Palmer’s division, Crittenden’s corps. On December 26th, three days before the battle, the 1st was engaged with the enemy. Gen. Crittenden says in his report, he marched toward Lavergne and “two miles from that place the enemy met us in considerable force, and Gen. Cruft, with two regiments, the 1st Ky. and the 31st Ind., and some cavalry and artillery, attacked them, and with great spirit drove them across the creek and into the town.” The 1st, with other troops bivouacked until the 29th, within two and a half miles from Murfreesboro. In the great battle that immediately followed, the 1st bore its part and received commendations from its commanding officxers. Its losses were fourteen killed and forty-four wounded. The total casualties at this time were ninety-six. After the battle of Murfreesboro, the 1st remained with Rosecrans army during the winter. April 4, 1863, it was on an expedition from Readyville to Woodbury, which was attended with fighting and loss. June 30, 1863, in the organization of the Army of the Cumberland, the 1st Ky., under Col. Enyart, was in Cruft’s brigade, Palmer’s division, Crittenden’s corps. 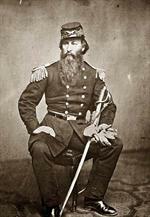 July 31st, the 1st was commanded by Maj. Hadlock, and the 2nd by Lieut. Col. Hurd, and Col. Sedgewick commanded the brigade. September 3rd the 1st was at the Sequatchie, near Jasper; on the 4th, at Shell Mound; on the 8th, at the base of Lookout Mountain; on the 10th at Rossville; on the 11th, at Ringgold; on the 12th, marched toward Lee and Gordon’s Mills, and skirmished there with the enemy; on the 14th, at Lee and Gordons’ Mills; on the 18th, at Crawfish Springs. It would be impossible in this place to describe the terrible scenes through which the 1st passed in the battle of Chickamauga. It was engaged both days, the 19th and the 20th of September, losing eighty-six men in killed and wounded . The reports mention the regiment as doing its full duty. In one report it is said: "Great praise is due to Companies B, D, G and K for coolness and bravery on the field." After the battle of Chickamauga the 1st remained on duty at Chattanooga. In the organization of the Army of the Cumberland, December 31, 1863, it was placed in the 4th Corps, Gen. Granger; 1st Division, Gen. Stanley, and the 1st Brigade, which was commanded by Col. Enyart. It also remained during the winter, and in April and May, 1864, Gen. Howard had command of the corps and Gen. Cruft, the brigade, while Col. Enyart was with his regiment. The 1st entered upon the first stages of Gen. Sherman’s Atlanta campaign, going as far as the Etowah River. It had then been in service about three full years, on continous active service. In the severest campaigns in West Virginia, at Shiloh and Corinth; marched through Tennessee, Alabama and to Louisville with Buell; back to Tennessee, with Rosecrans; through the great battle of Murfreesboro; in all the movements leading up to Chickamauga, and through the fiercest part of that battle, it had suffered many loses on the battlefield and from sickness. From Northern Georgia it was sent back to Kentucky, stationed at Covington, in the command of Gen. Hobson, who reports the 1st and 2nd Ky. as a part of his force, with which he was resisting the Morgan raid of June 18, 1864. In that month the three-years’ term of service expired and the 1st Ky. Infantry was mustered out at Covington, July 18, 1864. Company E of this regiment was detached early in 1861, and formed the 1st Ky,. or Simmonds Battery (see its account). It served in Virginia and made a fine reputation. First organized at Pendleton, Ohio, for three months April and May, 1861, but not recognized by Kentucky until June, when reorganized for three years. Duty at Pendleton, Ohio, April to July, 1861. Ordered to the Kanawha Valley, W. Va., July 10, 1861. Attached to Kanawha Brigade, West Virginia, to October, 1861. District of the Kanawha, W. Va., to January, 1862. 22nd Brigade, Army of Ohio, to February, 1862. 22nd Brigade, 4th Division, Army of Ohio, to September, 1862. 22nd Brigade, 4th Division, 2nd Corps, Army of Ohio, to November, 1862. 1st Brigade, 2nd Division, Left Wing 14th Army Corps, Army of the Cumberland, to January, 1863. 1st Brigade, 2nd Division, 21st Army Corps, Army of the Cumberland, to October, 1863. 1st Brigade, 1st Division, 4th Army Corps, to June, 1864. SERVICE.--Campaign in West Virginia July to October, 1861. March to Sissonville in rear of Wise, returning via Ravenswood and Charleston July 14-26. Moved to Gauley, arriving August 1. Moved to Camp Piatt, arriving August 25. Gauley Bridge August 28. Boone Court House September 1. Peytonia September 12. Moved to Raleigh September 20-27. Chapmansville September 25. Return to Gauley, arriving October 10. Operations in the Kanawha Valley October 19-November 16. Skirmish at Gauley Bridge October 28. At-. tack on Gauley by Floyd's Batteries November 1-9. Pursuit of Floyd November 10. Duty at Charleston December 4 to January 5, 1862. Ordered to Kentucky January 5, 1862. Camp near Bardstown January 24-February 13. March to Nashville, Tenn., February 14-March 12, and to Savannah, Tenn., March 13-April 5. Battle of Shiloh, Tenn., April 6-7. Advance on and siege of Corinth, Miss., April 29-May 30. Phillips Creek, Widow Serratt's, May 21. Bridge Creek, before Corinth, May 28. Occupation of Corinth May 30. Pursuit to Booneville May 31-June 6. Buell's Campaign in Northern Alabama and Middle Tennessee June to August. March to Louisville, Ky., in pursuit of Bragg, August 21-September 25. Pursuit of Bragg to London, Ky., October 1-22. Battle of Perryville, Ky., October 8. Camp Wild Cat October 17. Nelson's Cross Roads October 18. Destruction of Salt Works at Goose Creek October 23-24. March to Nashville, Tenn., October 24-November 9, and duty there until December 26. Advance on Murfreesboro December 26-30. Lavergne December 26-27. Battle of Stone's River December 30-31, 1862, and January 1-3, 1863. Duty at Cripple Creek until June. Expedition to Woodbury April 2. Snow Hill, Woodbury,, April 3. Middle Tennessee (or Tullahoma) Campaign June 24-July 7. At Manchester July 9 to August 16. Passage of Cumberland Mountains and Tennessee River, and Chickamauga (Ga.) Campaign August 16-September 22. Pea Vine Creek September 10. Lee and Gordon's Mills September 11-13. Battle of Chickamauga September 19-20. Siege of Chattanooga September 24-October 27. Reopening Tennessee River October 26-29. Duty at Bridgeport, Ala., until January 26, 1864. At Ooltewah, Ga., until May 17, and at Resaca until May 29. Ordered to Kentucky May 29. Operations against Morgan's Invasion of Kentucky May 31-June 18. Mt. Sterling June 9. Mustered out June 18, 1864. Regiment lost during service 60 Enlisted men killed and mortally wounded and 1 Officer and 82 Enlisted men by disease. Total 143. Copyright © 2000-2009, Robert M. Baker, Timothy Downey, and the Sons of Union Veterans of the Civil War, Kentucky Dept.